My daughter-in-law grew up Jew-ish. Her mom is Jewish, her dad is not, and they weren’t observant besides the occasional seder. When she married my son she seemed okay with him wanting to live a more Jewish life — I’m talking about a somewhat observant Reform Jewish life, like how we raised him — and everything seemed great. They sent their kids to a Jewish preschool, are members of a synagogue and observe the big holidays. In recent years she has become quite, as she puts it, “spiritual,” and is often going to these new age workshops and retreats at ashrams where people talk about their gurus and chant. This summer she brought their 11-year-old daughter with her. Seesaw, at what point does all this spirituality become religious? I know it is not my place to tell her how to live her life or raise their kids, but is it my place to point out that this could be confusing for them, not to mention her? I can tell you that “clinically,” you have little to worry about. Your daughter-in-law is Jewish (not Jew-ish, just Jewish). She identifies as a Jew and has a Jewish parent. 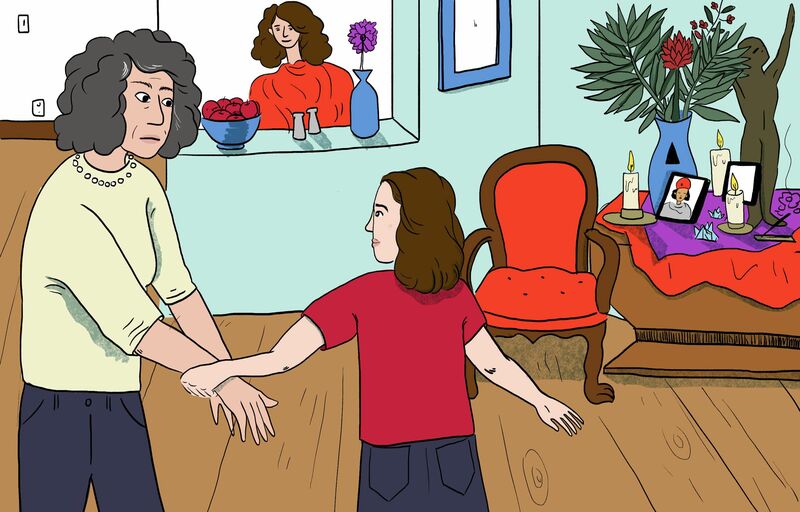 Your son’s marriage is an in-marriage, a marriage between two incontestably Jewish Jews. Now, for Jewish child-rearing that’s a HUGE advantage. These days, among the non-Orthodox, just 6% of children in in-married homes are raised as non-Jews. The number is more than 6 times as high (37%) among the intermarried. I bring this statistic only as evidence that your son’s in-marriage is a strong indicator of Jewish upbringing. Almost all children of two Jewish parents grow up to see themselves as Jews. In short, unless there’s more to this story than I know, please stop worrying whether your granddaughter will be Jewish. Next. Participation in Eastern spirituality endeavors is NOT seen by most Jews as abandonment of Jewish identity. Whereas Christianity and Islam have been historically in a contested, if not conflictual, relationship with Judaism, such is not the case for spiritual quest, meditation practices, or even Hinduism and Buddhism. Now having said, in effect, “don’t worry,” I do have one recommendation of something you can do which is based on research: Spend quality time and spend Jewish time with your granddaughter and her parents. In “The Jew Within,” Arnold Eisen and I found that people tend to see their grandparents as Jewish role models and view them fondly. More recent research — on both Jews and non-Jews — testifies to the influence of grandparents on grandchildren’s Jewish engagement. So, if you’re worried or not (don’t be), try to focus on enjoying holidays, Shabbat and life cycle events with your family. And if you can, offer to support your granddaughter’s Jewish educational experiences, such as camp, youth group activities, or, in time, a teen trip to Israel. All of those will raise the chances that your 11-year-old granddaughter will marry someone Jewish and give you Jewish great grandchildren one day!